New Zealand booked their spot in a second consecutive World Cup final after beating South Africa in a thrilling battle royal in the rain at Twickenham. Tries by Jerome Kaino and Beauden Barrett helped the All Blacks to a 20-18 win over their old enemy and kept the Boks try-less in a Test that was a purist’s dream. 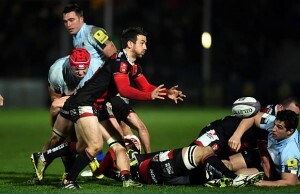 Dan Carter’s ten points settled the game in his side’s favour. Handre Pollard kicked four penalties and Pat Lambie one as the Boks fell short. The Springboks led 12-7 at the break but it was the Kiwis who dominated the territory and possession. This was a worthy match for such an occasion as a World Cup semi-final and the 91st meeting between the planet’s two best sides. Many predicted an easy win for Steve Hansen’s men – a team described as “the best ever” by Bok coach Heyneke Meyer. Pollard gave the Boks a 3-0 lead after three minutes after his forwards’ driving maul was rewarded with a penalty. The All Blacks scored after some sustained pressure in the opposition’s 22 – and a mistake by Bryan Habana. Habana shot out of the defensive line leaving space on the blind-side for New Zealand’s backs to exploit. The Kiwis sent the ball through the hands to the flank who shrugged off Lood de Jager’s high tackle attempt to score. Carter’s conversion put New Zealand 7-3. Pollard’s second penalty reduced the deficit five minutes later after Jerome Garces caught Richie McCaw offside. Both teams’ game-plans were clear from the get-go: play in the opposition’s half (a staple of wet weather rugby throughout history) and wait for mistakes. Fourie du Preez was immense, dictating the play with his excellent kicking-game, using up-and-unders, while Aaron Smith – superb again – and Carter used little kicks behind the on-rushing defence. The Springbok dominated the breakdown in the first 40 minutes. Francois Louw was a beast; he twice cut down Julian Savea, while Bismarck du Plessis and Schalk Burger were heroic. South Africa’s back three were superb under the high ball in the first half, winning half a dozen 50/50 balls. 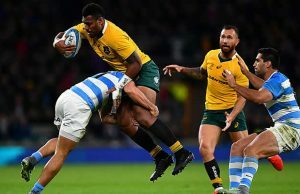 Habana made amends for his defensive lapse when he won one of his skipper’s high-balls which resulted in Pollard giving the Bokke a 9-7 lead with his third penalty goal. Carter hit a post with his first penalty attempt and despite the All Blacks spending 50 percent of the half camped between the Springbok 10 and 22 metre lines, they went in at half-time five points behind and a man down. Try-scorer Kaino was sent to the sin-bin for cynical play when his lazy run allowed him to kick away the ball at a Bok ruck. Pollard was ice cool with the penalty. South Africa could not make their numerical advantage count but were unlucky as Garces missed a McCaw knock-on which resulted in Carter’s drop goal edging the Blacks to within two. This was the moment the momentum swung in New Zealand’s favour. Hansen brought on Barrett who immediately made an impact. Burger, running from his line did not protect the ball in well enough in contact and Carter ripped the ball free. The play was switched left and Ma’a Nonu ran across the Bok 22, drew a defender, allowing the substitute a free run-in. Carter’s touch-line conversion was good as the Kiwis regained the lead. New Zealand continued to dominate the Test but Pollard’s fifth penalty kept Meyer’s team in the hunt. However, on the hour Carter cancelled out the 21-year-old’s penalty when Eben Etzebeth was pinged for sealing off at the breakdown. The Boks were playing catch-up and were handed a tough blow when Victor Matfield was penalised for a neck role which was not reviewed by the Frenchman and a potential three points was lost. Pat Lambie’s penalty 12 minutes from time gave the Boks hope but they could not get their hands on the ball as the defending champions experience proved crucial in closing out an epic semi-final. 15 Ben Smith, 14 Nehe Milner-Skudder, 13 Conrad Smith, 12 Ma’a Nonu, 11 Julian Savea, 10 Daniel Carter, 9 Aaron Smith, 8 Kieran Read, 7 Richie McCaw (captain), 6 Jerome Kaino, 5 Samuel Whitelock, 4 Brodie Retallick, 3 Owen Franks, 2 Dane Coles, 1 Joe Moody. Replacements: 16 Keven Mealamu, 17 Ben Franks, 18 Charlie Faumuina, 19 Victor Vito, 20 Sam Cane, 21 Tawera Kerr-Barlow, 22 Beauden Barrett, 23 Sonny Bill Williams. Replacements: 16 Adriaan Strauss, 17 Trevor Nyakane, 18 Jannie du Plessis, 19 Victor Matfield, 20 Willem Alberts, 21 Ruan Pienaar, 22 Patrick Lambie, 23 Jan Serfontein.